MIX cream cheese and dressing until well blended. Spread evenly onto tortillas; sprinkle with carrots and onions. 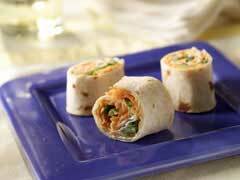 ROLL up tortillas tightly; wrap in plastic wrap. Refrigerate at least 30 minutes. UNWRAP when ready to serve. Cut each roll into 6 pieces. Place on serving plate; sprinkle with paprika. Take a Shortcut: Look for shredded carrots in the produce section of your supermarket. If the shreds are too large, just chop them to make them smaller.